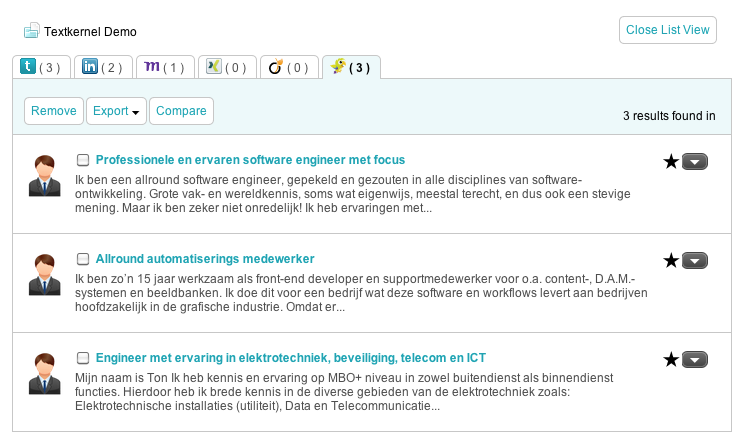 Textkernel is very proud to present the 2.1 release of its semantic candidate search software Search!. This release is full of new features that make it even easier to find the perfect candidate. When typing into the search box, you will get automatic suggestions for search terms. Not only will the semantic software give you ideas for words to include, it will also give you suggestions for the interpretation of search terms. When entering ‘dev’ perhaps you want to include ‘developer’ as a keyword, ‘software developer’ as a job title or ‘web development’ as a skill. Or maybe you just mean the Dutch city ‘deventer’. You can now create different projects in Search! and store your search profiles. This allows you to easily continue searching with your last queries. Besides saving projects and searches, you can also save results from all databases. Not only can you save your search profiles, you can also set up e-mail alerts for new matches. Every day, week or month you can receive an e-mail alert with the list of new candidates in your database that match your search profile. When searching externally, there may be a limited amount of data that can be sent via the API (Google, Bing, or any other external API). Textkernel automatically and intelligently shrinks your search query to the relevant and most important terms, to match the restrictions of the given API while still retrieving the best results from external databases. Search! 2.1 added searching on Jobbird.com, the largest job board in the Netherlands, to the existing list of external searchers. Search! 2.1 contains some minor changes to the user interface to make the use of Search! even more intuitive. Are you not able to attend or are you interested in a personal demo? Contact us.